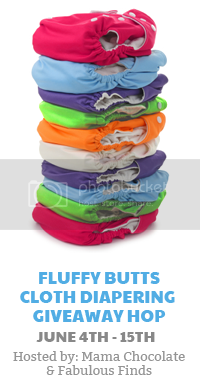 Welcome to the Fluffy Butts Cloth Diapering Giveaway Hop! This Giveaway Hop is hosted by Fabulous Finds and Mama Chocolate, and we have over 70 other participating blogs, all with fluffy cloth-diaper themed giveaway prizes for you, each with a value of at least $25! Enter to win our fabulous Grand Prize right here and then visit each blog on the linky below to get in on all the fluffy fun! We’ll wrap it up on Friday, June 15th at 11:59pm EST and announce the lucky winners, so start getting your entries in now! After you’ve entered here for the Grand Prize, be sure to scroll down and visit all the awesome blogs on the linky below to enter their fluffy giveaways! Those marked with an asterisk * indicate a prize package with a value of $100 or more! Besides this super-awesome Grand Prize, you can also win another prize package of fluff from Mama Chocolate, worth over $80.00, including a Thirsties Duo Diaper, Kushies XP diaper, and more! Over $500 value, this Grand Prize package is all going to one very lucky entrant! Our sponsors include Jungle Roo Cloth Diapers, Go Green Pocket Diapers, and the participating bloggers of the Fluffy Butts event! One Size Pocket diaper with a modern design, and made from minky suedecloth or soft & stretchy PUL. Provides a comfortable fit for baby, with snap closure for quick and easy diaper changes. One 3-layer microfiber insert is included with every diaper. One size fits 9-30lbs! Two zippered, moisture-proof PUL compartments with a handle for hanging or carrying! At 12″x14″, this wetbag holds about 8 diapers, plus inserts. 4 sizes in one! Our unique configuration of adjustable rise and waist snaps provides TRUE birth-to-potty fit. Never un-stuff a dirty diaper again! Inserts self-agitate out in the wash cycle. Dual Gussets™ Technology provides unbeatable leak protection. Soft, stay-dry sueded lining gently shields your baby from moisture. Waterproof diaper outer keeps diaper trim and fashion-forward! The Adapt-a-snap™ easily attaches to any snap diaper with two rows of 10 waist snaps with standard 1-inch spacing. Unlike traditional hook/loop closure systems which are perminately affixed to the diaper and difficult to replace, the Adapt-a-snap can be easily removed, making it possible to use the same set of diapers and have both the convenience of hook/loop on wiggly infants, and the security of snaps for toddlers who can un-fasten hook/loop systems. The Adapt-a-snap™ is also a great way to make your stash of snap diapers temporarily baby-sitter or grandparent friendly! No-monnia can be used as a cloth diaper stripping agent to rid your stash of accumulated detergent, hard water mineral, and ammonia residue, serving to restore diaper absorbency and reduce skin irritaton. Even better, No-monnia can be used as a rinse additive each time you wash to inhibit ammonia formation and accumulation, and it also facilitates the removal of detergent during the rinse cycle. The diaper sprayer is a fresh way to clean soiled cloth diapers. Its high-pressure spray rinses clean even the messiest diapers. The mess goes where it is supposed to go – and your hands stay clean. The bumGenius Diaper Sprayer is very easy to install on your toilet and is now updated with new anti-drip technology! During potty training, the sprayer is perfect for rinsing potty chairs! i’d love an apple scent! Previous post: Diamond Candles 24-hour Flash Giveaway! Next post: Blogger Sign Ups – Free to Join Bunkbed Giveaway!